After lengthy delays to secure permits and certifications, four spirits are now bottled and for sale. The wait is over, the permits are processed and the barrels are filling up at a new distillery south of Gaston. 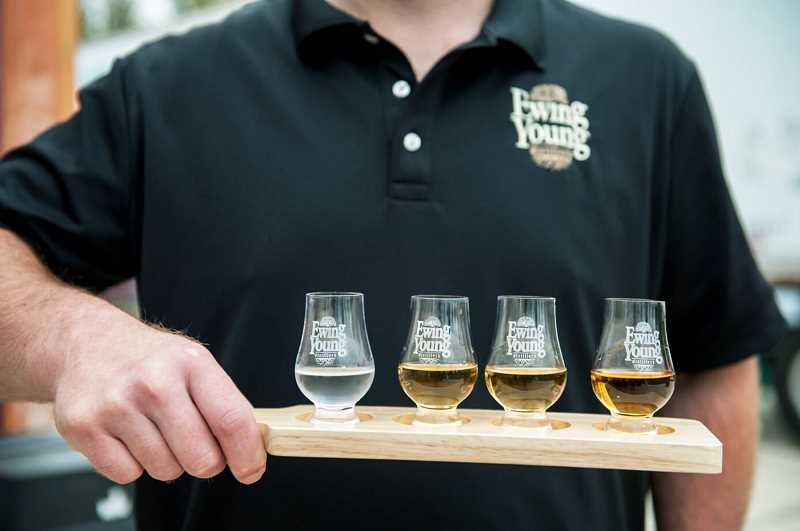 Nestled on a 145-acre horse farm at the historical site of Ewing Young's gravesite, the aptly named Ewing Young Distillery began production in June. A heated tasting tent has been erected at a spot next to the famous Ewing Young tree; the tent will serve until construction on a tasting room is completed. "The distillery is all built and the tasting room is up next; it will be placed on the top of the hill on the big lawn next to the tree," co-owner and general manager Bev Root said. "Originally, we were going to place it in the stallion barn, and the (veterinarian) got really busy and it started looking like there would be too many conflicts with traffic." The knowledge and excitement of operating a distillery on the same property where famed early Oregon settler Ewing Young distilled spirits was a long process for Root. First, she had to leave her job as a corporate attorney in June 2016. She then obtained a distilling certificate from Moonshine University in Louisville, Ky.
Root decided to change careers from law to distilling after family members Jack and Cookie Root purchased the property. Bev Root's husband, Doug, is a history buff and researched the history of the old farm. He discovered that Ewing Young may have been a distiller himself; in fact, he was the first distiller in Oregon. There were many hurdles to clear before the Roots could follow in Young's footsteps. "It is amazing how many hoops you have to jump through to start a business like this," she said. "It's a good thing that I didn't know what I was in for. The regulatory burden on businesses in general, and in particular, in this type of business, is pretty amazing how many different agencies you have to deal with and pay fees to. It is daunting." After more than six months of paperwork, the distiller was plugged in and the hum of electricity filled the building. The distillery bottles four different kinds of spirits, all kept on stock at the Oregon Liquor Control Commission warehouse. "They basically hold the spirits and you have to go around to the different liquor stores, bars and restaurants to sell it and then they order it," Root said. Ewing Young's distiller, Tucker Mortensen, is a trained French chef who lived, worked and went to school in Paris for three years. "He has an amazing palate. He brews beer and has worked in wineries and he really helped to improve our spirits and did some finishing on it that is remarkable," Root said. The Ewing Young Distillery is the third of its kind to be erected in Yamhill County. It's located west of Newberg, and about 11 miles southeast of Gaston, at 18715 N.E. Yamhill-Newberg Highway. The distillery is hosting its first Fall Whiskey Festival from noon to 2 p.m. this Saturday, Oct. 13. The festival is a family event and includes activities for all ages. Activities include pumpkin painting, miniature horses, pony cart rides for the little ones and draft horses to provide cart rides, along with a historical talk about the property and Ewing Young. Sandwiches will be available for purchase from the Farmers Lunchbox.